Seven sensational St. Louis design projects have been singled out for our second annual Architectural Finesse Awards. The Exterior Elevation. Jeff Day & Associates. Photography courtesy of Jeff Day & Associates. The Mud Room. Mitchell Wall Architecture & Design. Photography by Alise O'Brien. The Before & After. Space, LLC. Photography by Anne Matheis. The Before & After. Before photo. Space, LLC. Photography by Anne Matheis. The Lower Level/Bar. Directions In Design, Inc. Architect: John Peckham, AIA. Photography by Alise O'Brien. The Library. Directions In Design, Inc. Architect: John Peckham, AIA. Photography by Alise O'Brien. The Exterior Elevation. Bozich Construction. Photography by Michael Jacob. The Outdoor Living Area. Bozich Construction. Photography by Michael Jacob. Outstanding design deserves recognition, and seven sensational St. Louis design projects have been singled out for our second annual Architectural Finesse Awards. Evaluated by a distinguished panel of Kansas City architects, the winning entries include a unique variety of newly built and remodeled living spaces, honored for their architectural ingenuity and integrity and overall aesthetic appeal. While challenged with a site that lacked inspiration and was void of natural surroundings, Jeff Day & Associates had the freedom to design a home that would make a strong statement. Contributing to the strong statement are the home’s roofline, windows, exquisite woodworking and stonework. The majority of the home’s second floor is built into the roof structure. Recessed dormers provide natural light into the workstations of the loft space. Above the garage, custom designed windows along the north and south sides of the house allow natural light to stream into the two private bedroom suites. Beautifully designed, the home is also very energy efficient. Highlights include a geothermal HVAC system, 2x6 exterior frame walls with spray foam insulation and a super-insulated roof structure. The foundation is a pre-fabricated concrete panel system insulated to R38. Unique and whimsical in composition, the exterior of this home demonstrates excellent workmanship and detail. The consistent use of unifying design elements give the home a strong and inviting look. A place for everything, and everything in its place… thanks to Mitchell Wall Architecture and Design. The firm designed a mud room/family center for an active family to better accommodate their busy lifestyle. The challenge was to design a room that complemented and blended with the surrounding rooms. With cubbies for each family member and a center island work station with additional cubbies for storing hobbies, gifts and wrapping paper, the family is able to stay organized. The island also has built-in docking stations for electronics. Built-in benches make removing or changing shoes easy. A unique feature is the doggy bath. While used to hose down the family pup, the shower has also come in handy for the homeowner, who is an avid gardener. It’s been a great place for her to remove her dirty garden shoes or hose off one of the kids after a tough day of play. The space created is comfortable and inviting while still elegant. The mud room looks like it functions well and is accessible for the family. With the challenge of gut-renovating a 100-year-old home, Space, LLC and their client worked closely to transform the dated century home into a more functional layout for the family of five. Removing walls and installing new structure achieved an open, cheerful flow. The main thrust of the design removed an existing narrow staircase only accessible through a bedroom on the main floor. A new stairway was designed and placed in the center of the house forming a central focus for a new modern open floor plan radiating out from the stairs. The architects detailed the stairs to highlight the end grain of the riser and side-exposed treads, mitering all connections to create a monolithic wood appearance. The staircase is grounded by a custom designed and fabricated steel handrail. Natural light flows into the center of the home through a new skylight positioned above the stairs. 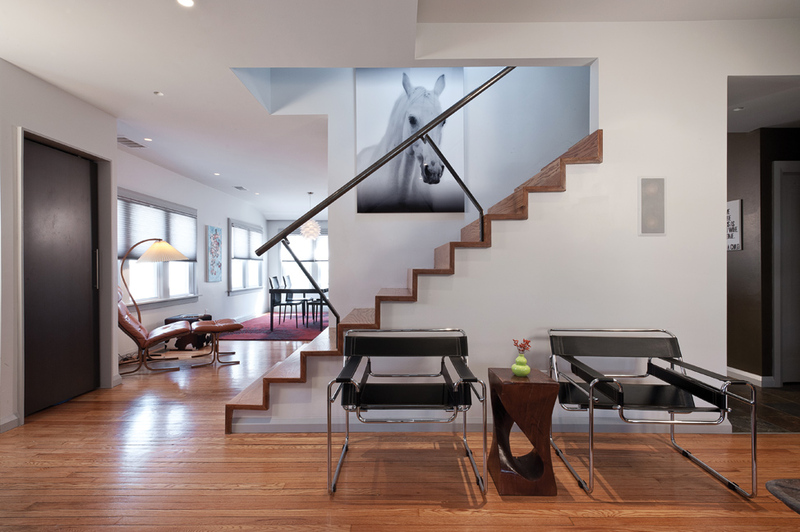 The stair addition is a well-designed transformation of the space. The space has an effective handling of natural and fixture lighting. The consistent and even-handed selection of materials and furnishings creates a modern open floor plan. The non-code railing is very cool! 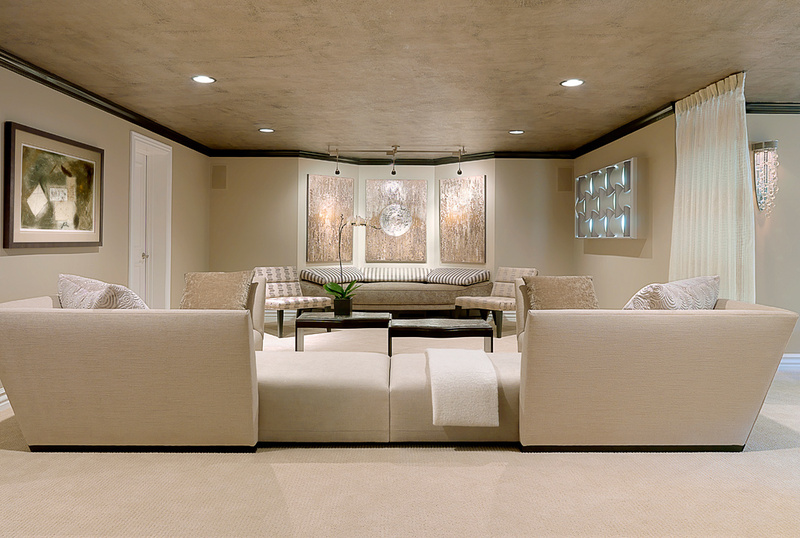 Transforming an unfinished room in their basement into a bar area, Direction in Design, Inc. created a space that is an extension of their client’s lower level family room. The back of the bar is placed between two closet doors, which were removed and replaced with lighted drywall niches displaying six vibrant hand blown glass pieces. 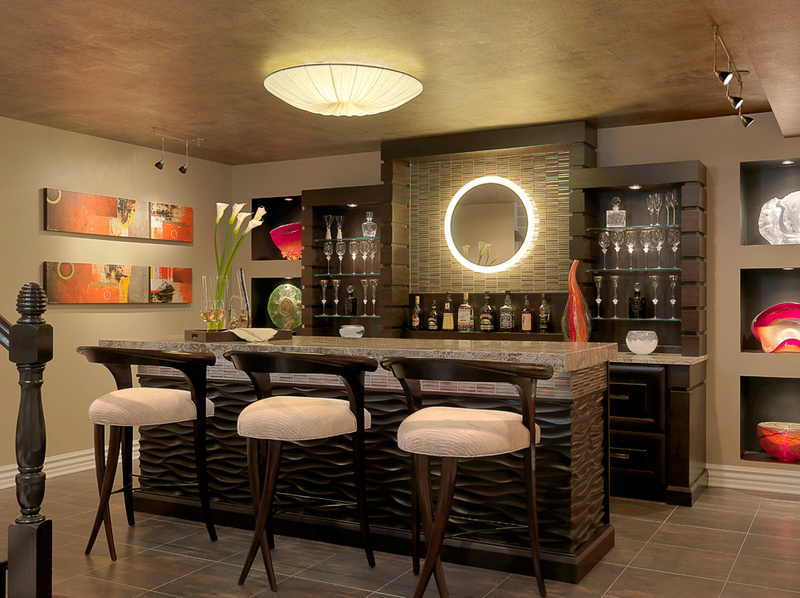 Between the niches, the back bar is tiled in a horizontal glass tile in tones of taupe, beige and brown. A lighted mirror over the tile illuminates the bar. Stacked wenge wood blocks with lighted glass shelves highlight the back bar. Stained in the same dark wenge finish as the back bar, the front bar has three-dimensional panels that create a wave look. For visual interest, a band of horizontal glass tile around the taupe and brown granite countertop contains accent fiber optic lights that change color and create visual interest in the space. The lower level family room is an extension of the bar and has an octagonal wall that features custom painted textured artwork and a custom designed bench with wedge back pillows. Everything about the bar is awesome – material selection, scale of elements, layout, lighting, artwork and furnishings. The result is an elegant yet casual space. Directions in Design started with a clean palette when designing the library in a high rise condo, with the goal of designing a warm, inviting, relaxing yet functional space that was rich in architectural detail. Custom leaded and beveled glass doors lead into the library. The walnut wood ceiling features a detailed crossbeam layout, which allowed down lights to be nestled into the beams. All the millwork in the library is walnut. Two custom desks were created for each homeowner to accommodate their storage, filing and computer wiring needs. The shelves have a moulded detail on the front edge that frames glass inserts so light can shine through the unit. Special granite, “Blue Jeans,” was found in Florida and surrounds the fireplace. The flat screen TV was built into the upper structure with crown moulding and fluted pilasters. The rich and inviting library is very well done. The colors, the details… it is beautiful! Rustic, mountain-themed landscaping and cobblestone laid pavers leading you from the street to the entry of the home add to the drama and grandeur of the exterior elevation of this home built by Bozich Construction. The exterior is done in true stucco with hand glazing. The entry is constructed of cut aux vases limestone and balustrade from Earthworks. The steps and porch are also made from the same materials. The Porte cochere is done in a radius construction and features a compound arch. Significant engineering was needed to form the arch so that it is supportive of the structure. The stone pieces were laid first with a wood template to ensure consistent mortar joints so there is no fanning of the joints. Stones were hand cut to shape to form consistent pieces. The center stone is 33” tall and weighs over 200 pounds. The classic nature of the varied forms has a consistency that keeps them cohesive. You can tell this space was thoroughly designed from floor to ceiling. The masonry work is beautifully executed. Elements such as full stonewalls, railings and flagstone paving give this outdoor living space, created by Bozich Construction, a natural feeling with all the comforts of home. Rustic timber beams that carry out from the home’s interior hearth room create a framed roof look while protecting the space from the outdoor elements. The ceiling is hand scraped and hewn with tongue-and-grooved construction. An outdoor kitchen is equipped for entertaining with a grill and refrigerator. The homeowners and their guests can pull up a seat around the kitchen island, made from three-inch-thick, non-lamintated sandstone. A cozy seating area is positioned around the stone fireplace making this spot functional for all seasons. The rustic mantel is constructed from reclaimed wood. The flagstone paving carries from the covered living area to the pool area. This outdoor living area is well designed all around. The material selection is spot on for the look they were trying to achieve. 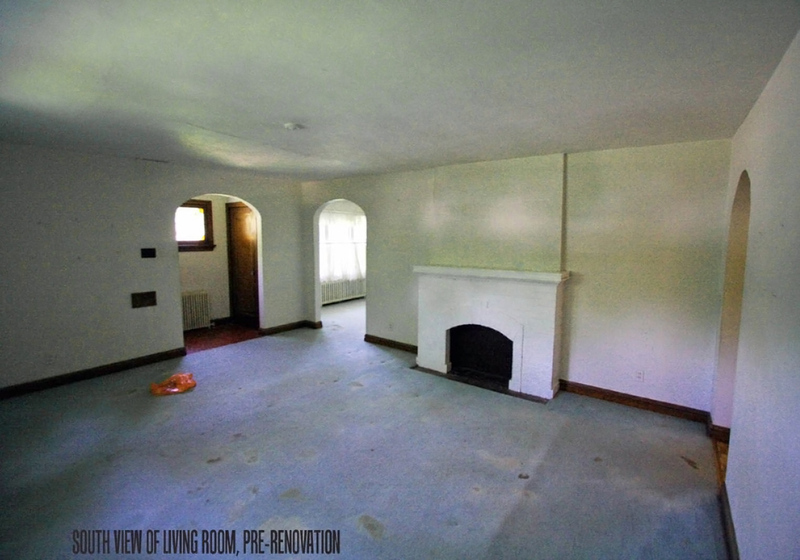 The end result is a warm and inviting room that is a great social space. Ron Stallbaumer is principal at Wendlandt & Stallbaumer Architects. Licensed in Kansas, Missouri and Colorado, Ron is a member of the American Institute of Architects (AIA), is NCARB Certified (National Council of Architectural Registration Boards) and is a LEED Accredited Professional. 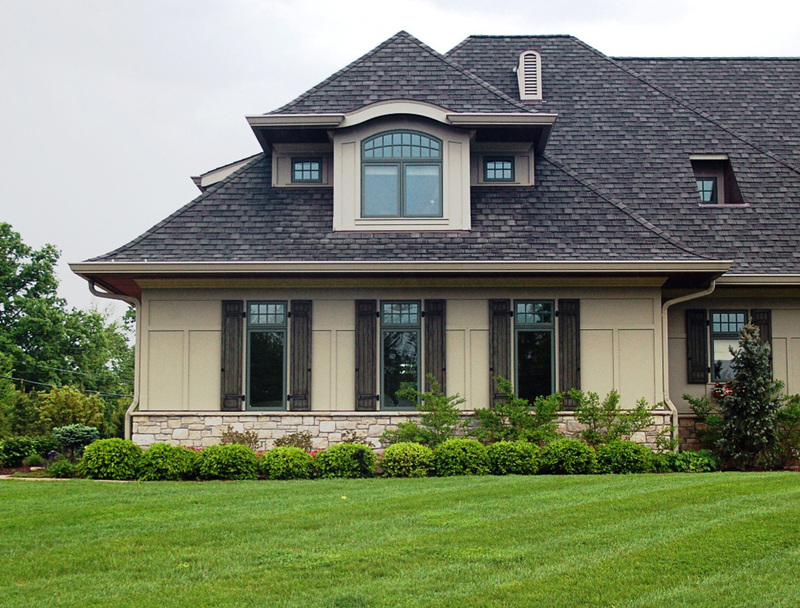 Ron shares his Overland Park, Kansas home with his architect wife, their two daughters and a schnauzer. Wolfgang Trost came to the United States with his German family to pursue the “American Dream.” After graduating from the University of Kansas in 1977, Wolfgang has been passionate about quality design and architecture. His Kansas City-based architectural firm, Wolfgang Trost Architects, practices the goal of excellent design with function and beauty with styles ranging from contemporary to classically traditional. Scott Bickford and his staff at Bickford and Company have focused on residential architecture, designing nearly 6,000 projects over the past 34 years. Respect for the craftsmen has led to great relationships among the construction community and a reputation for producing buildable designs regardless of their complexity. While the palette varies with each client there is always a strong emphasis on lifestyle and function making his practice one of designing homes and not just houses.